Just a note to check out Jeanne Liotta's program, Of Dark And Luminous Matter at Millennium Film Workshop, Sat. Dec. 15. 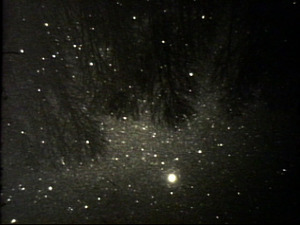 Included in this show will be the starry night sky field recording, OBSERVANDO EL CIELO, hailed as one of the 10 best films of 2007 by Chrissie Iles in Artforum! (And adored by Invisible Cinema in tiny blog documents and comments fields!) You can read more about this film from Michael Sicinski at GreenCine Daily. Sublime is Now. Amor Fati!" - J.L. I must see this!!! ECLIPSE was tremendous.